There’s more to having a beach cottage than fun and sun. As with any home ( no matter the size) there’s always a running list of to-do’s. Our bathroom has been in dire need of an update for several years and it finally made it to the top of the list this season! 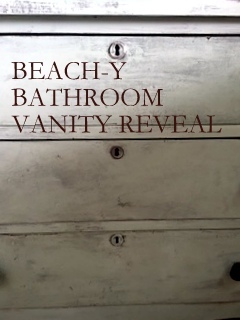 Come on in to see the before and after of our Beach-y Bathroom Vanity Reveal and find out who won the Garden Shop Giveaway!You know how remodels go. One thing always leads to another. 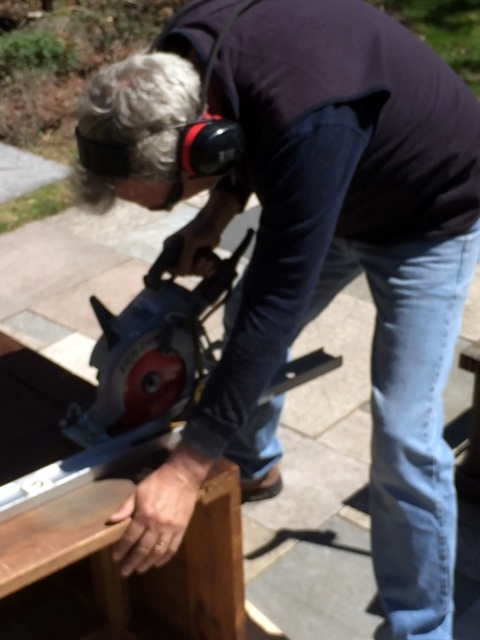 Ours started when we installed new flooring in the cottage bathroom a couple of years ago. Once the floor went in the vanity looked so tired and outdated. 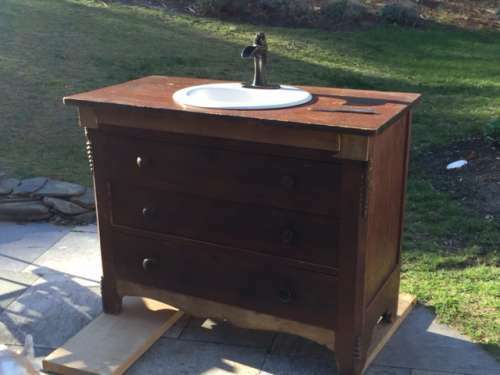 My handsome Yankee was going to build a custom bathroom vanity cabinet until we were both inspired by the idea of re-purposing a dresser into a vanity. 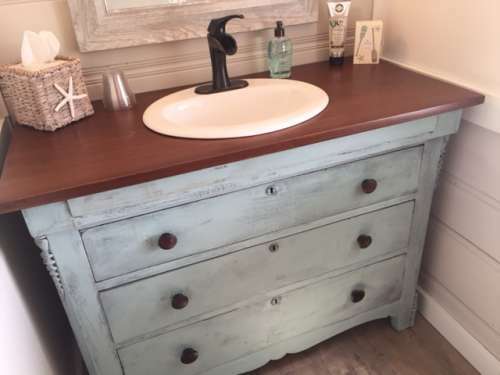 You know how much we love re-purposing so we began the search for the perfect sized dresser to turn into our perfect beach-y bathroom vanity. It’s not a new idea by any means. One trip around Pinterest and you’ll find them by the hundreds but, each one is made unique by the way you choose to finish it. I’ve seen them with new stone or quartz tops instead of wood. We went with wood for the look and the cost factor. We are fortunate to live near an area with loads of little antique shops where you can find good deals. 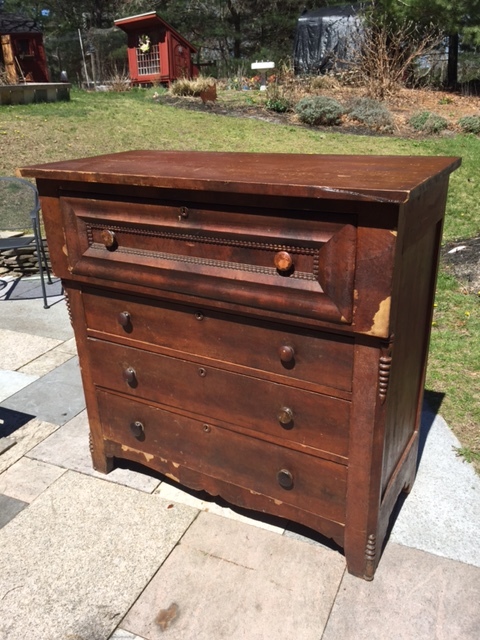 This antique dresser was made in the late 1800’s and had seen better days for sure! We both fell in love with the cute details on the frame and it was the right width and depth for our needs but, it was too tall. My hubby assured me he could just saw the top drawer off and attach the original top to the dresser and we would be good as gold. Cutting her down to size in the nicest of ways! 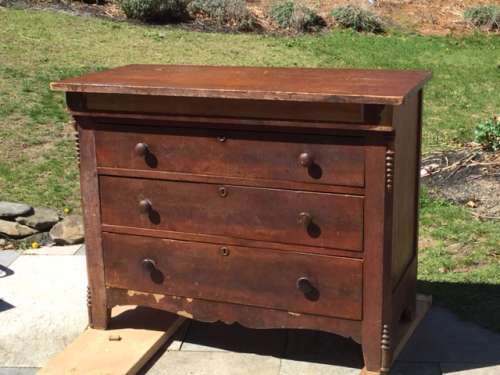 Plus, the style of this dresser reminded him of the types of furniture you would see in a Saquish cottage growing up. Most people didn’t run out and furnish their summer cottages with brand new pieces back in the day. Cottage style was born out of using left over furniture and comfy cast offs and we wanted to stay true to that ideal. She was a steel for $56.00 so we loaded her up and brought her home for for her new makeover. Look how cottage-y she is without that big heavy top drawer weighing her down. 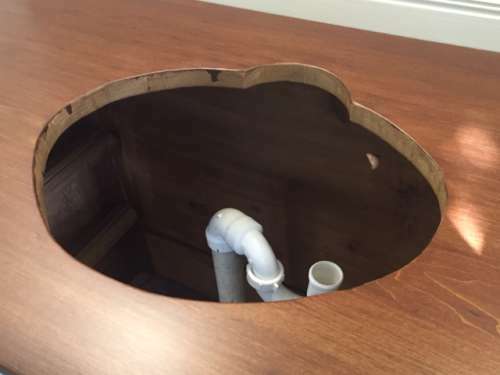 Next he cut a hole in the top for the the sink. The sink came with a template for the opening. Once that was finished he scraped off the old peeling laminate so I would have a more even surface to paint on. 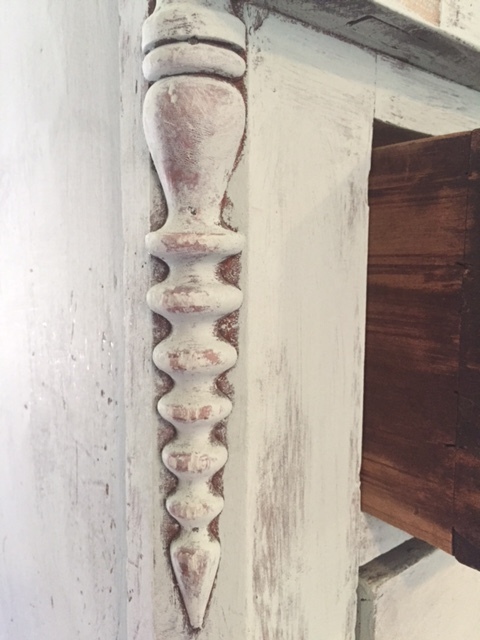 I chose one of my favorite Annie Sloan Chalk Paint colors for this project. 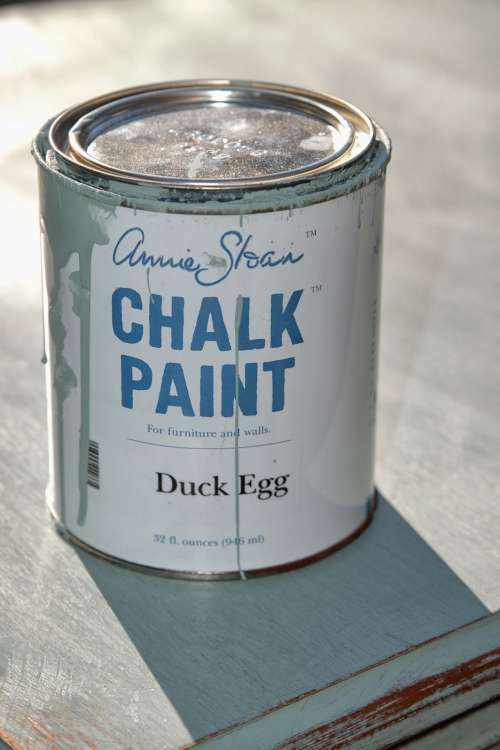 Duck Egg is a perfect beach-y blue. It also works very well in Country French and Scandinavian design. I love the little details on this piece. One of the great things about working with ASCP is that there is no preparation other than cleaning the surface with a tacky cloth or a damp rag before painting, however, if your piece has chipped paint, you should scrape and lightly sand first. The more underlying character a piece has the better the effect. Here she is perched on our dining room table getting her makeover. 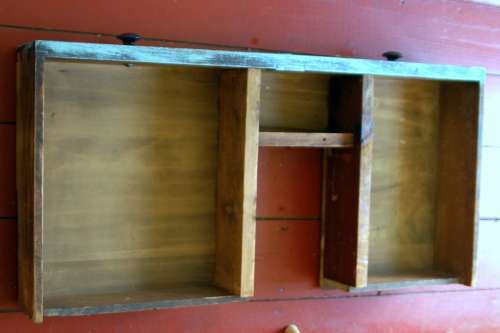 This dresser had decades of wear and tear and layers of dried, cracked varnish. Yummy! The trick is not to be tooooo heavy handed with your paint or your brush strokes when you are going for an aged or washed look. I tend to start with a fairly dry brush and just keep adding until I get the coverage I’m looking for. With this vanity I wanted to achieve a wash-a-shore look leaving some of the wood tones exposed underneath the blue paint. The scratches, holes and dents played into my theme perfectly! Once she was painted ( the bathroom got a fresh coat too ) we brought her down to the cottage for the install. The flooring is a vinyl plank flooring aptly named driftwood. Flooring options sure have come a long way haven’t they? All we needed for for tools was our tape measure and a sharp utility knife. No glue, no nails, no fuss. My Yankee sanded the top down to bare wood and applied two coats American Walnut stain. Then he applied a latex based polyurethane (two coats) to seal the wood. The drawers are still fully functional. My hubby re-fitted them to wrap around the plumbing so they can be used for storing bathroom essentials. 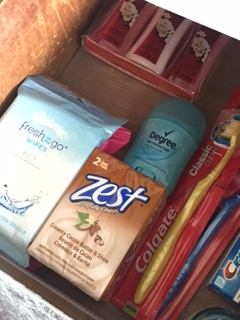 We keep emergency backup supplies since we’re out in the boonies with no nearby shopping. And now the moment you’ve been waiting for! Ta DA! 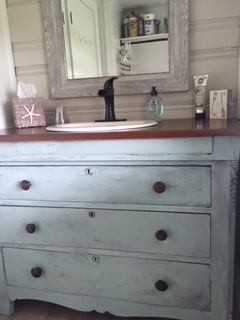 Here’s our Beach-y Bathroom Vanity! We are pretty happy with the final results and our summer renters have loved the new changes. There’s nothing like the feel of a fresh new bathroom, right? Here’s a few close ups of some of the details. My husband chose a well pump style faucet because it reminds him of the community well they used to go to when they were kids to get fresh water for cooking and washing up. I’m glad we don’t have to do that now a days! 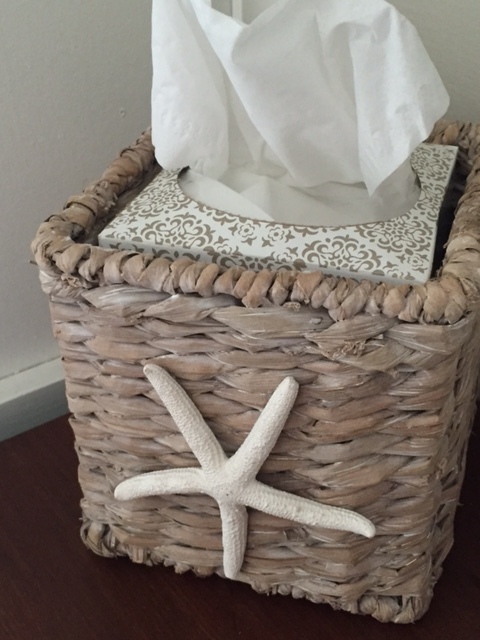 I couldn’t resist this sweet little tissue box holder with the starfish. Now, don’t laugh… LOL. 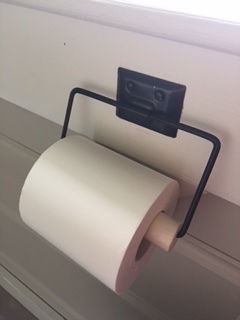 I know toilet paper hardly qualifies as a decor detail but I wanted you to see how the vintage holder ties into the light fixtures. It was original to the cottage and was chrome with icky rust spots on it. 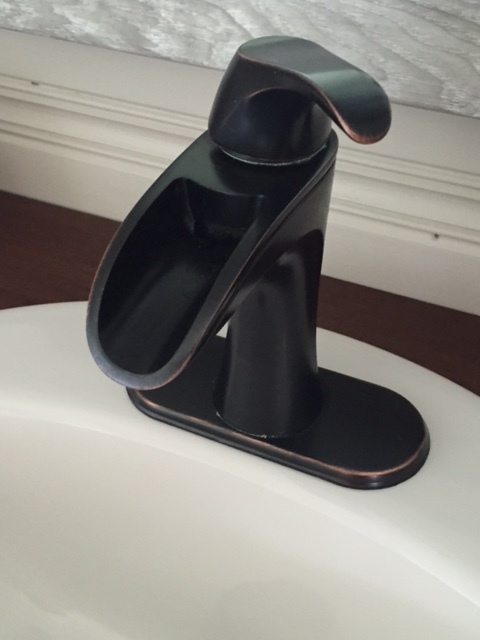 I sprayed it with aged bronze spray paint to match the faucet and new light fixtures. 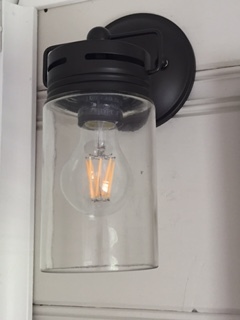 My brother in law even lucked out and found low voltage Edison Style light bulbs that work with solar power. We also kept the original wooden drawer pulls and I just polished them up. The tongue and groove wood paneling on the walls is called ” pickwick “. 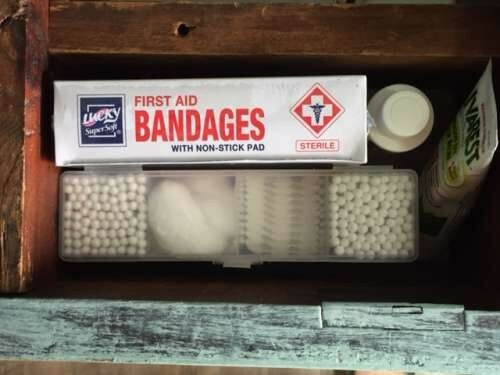 It’s widely used here in New England in cottages, cabins and homes. My in-laws living room is paneled in pickwick and it gives the room a beautiful warm glow year round. When left natural it ages to a beautiful honey golden color. We salvaged a few older pieces from a neighbor who happened to be remodeling his living room at the same time we were re-doing our bathroom! We had to fill in with a few new pieces as well but once it was all painted it all blended in to create the accent wall behind the vanity. My Yankee and I had a great time working on this project together right from the start. As with most projects, there are always a few bumps, set backs and surprises but in the end the reward of having finished something together always trumps the bumps! 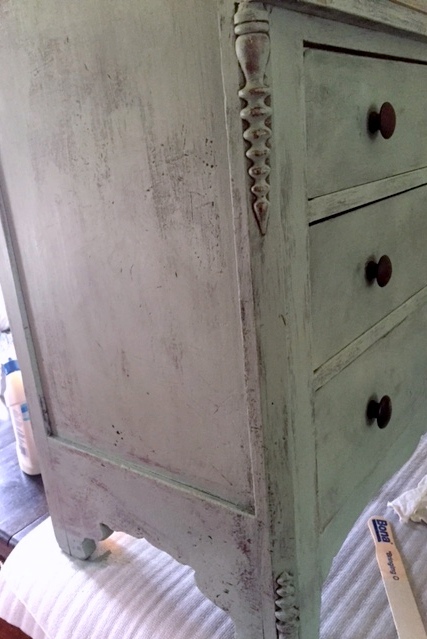 If you haven’t given Annie Sloan Chalk Paint a try yet you’re missing out! And I don’t want you to miss out on any fun with paint. Start with something small and get a feel for it then work yourself up to a larger piece when you feel more comfortable. Better yet, invite some friends over for a paint party! Have everyone bring something small to paint. Picture frames, chairs, lamps, candlesticks, and wooden crates make for easy first-time projects. We are just a few days away from our own beach vacation and boy are we ready! 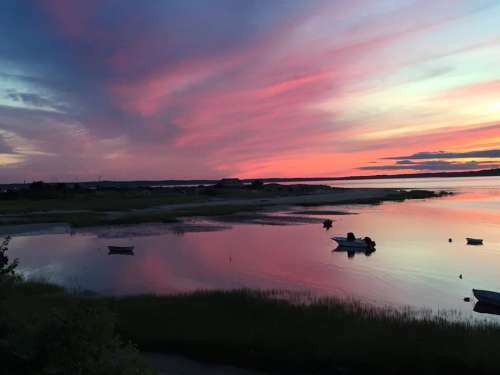 I hope you’re catching summer sunsets and getting your toes in the sand someplace this summer too! I love your new/old counter and basin. After our small fire in December, we had to have a new counter made and though it is very nice, I would have preferred something like yours. More rustic and certainly less than the $ 1,000 insurance had to pay for it. Thank you for sharing! I’m so sorry to hear about the fire. Bathroom cabinet manufacturers offer new pieces that look vintage but pricey. And if you like to re-purpose it’s fun to personalize a piece to your own liking. 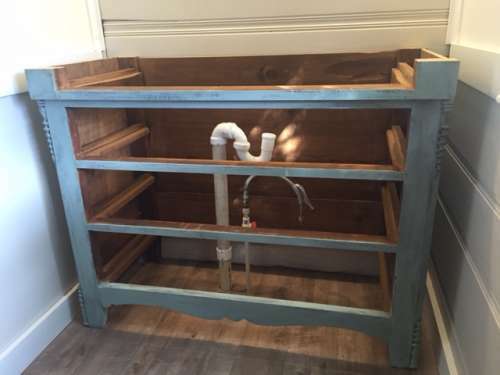 Your bathroom vanity turned out so nice! It definitely has a cozy beach look. My mother is redoing her bathroom, so I will share your story with her. Maybe I can help her make her own vanity as well. 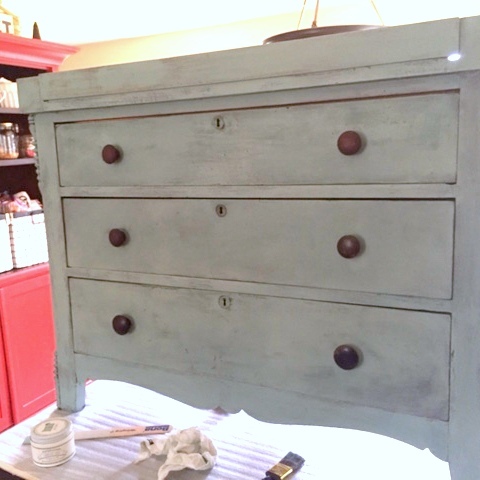 Every time I see that chalk paint being used I fall more in love. I think it’s time that I try it out. Now to find something to re-purpose! Congratulations to Cheryl for winning the giveaway! Thanks so much. How fun would that be to work on something with your mom. I agree. It’s time you tried chalk paint! You’ll love it! You both did a beautiful job. I love the vanity makeover. I second guess myself too much to try that, but love the way it turned out. Absolutely beautiful! I love everything about it. Very clever, creative and smart! I’m down South in AL/MS and it is so hot and humid here in the summers. Maybe one of these days I can be one to rent your cabin. I love the water and would love to be where I could spend some time on the ocean. My boyfriend has a beautiful pool to enjoy and a pond (I call it Goose Pooh Pond) that no amount of money would ever get me to swim in. We have lots of ducks and geese that stay on it not to mention the ones as they are migrating. I do enjoy your postings. I think this is the first time I have ever replied. I wish you and your family many hours of creativity, laughter and making good memories!!! Don’t we just LOVE Mary Jane?!?!?! 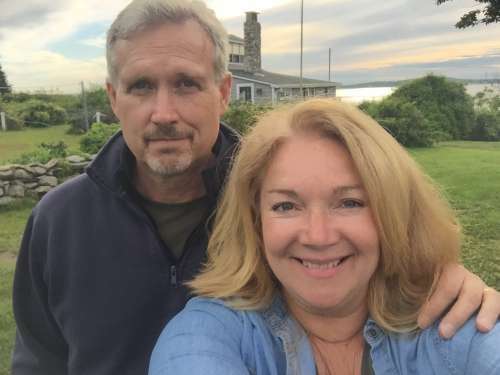 I love the bathroom re-do, but I really love the picture of you two. A winner! Beautiful! I didn’t even notice the neat spiral thingies until you painted them. You and your Yankee did a great job! I love this. I may need to do this in my bathroom. It needs a new counter for sure. Love. Love. Love!!! I am doing a bathroom in my basement, it is totally unfinished but I have my craft room there and the bathroom is a necessity – I am going to do something similar to what you did, thanks for the advice for painting. It is beautiful! Thanks for sharing your talents. God bless. Great job Deb. I love it. I just finished one the other day for sale…and also had an old 1950 cast iron sink that could be used with it. That is what I do refinish old pieces. You can always take a look at some of my stuff on my FB page when I have some….Neta Monroe…. Love the floors too, that is what we have in our hall and bath ,and now fixing to do both bedrooms this weekend… Be Blessed. Neta. Gosh, Deb! This is beautiful! Love it! She was a great find and in need of a makeover for sure! Love this!! Turned out so lovely. No what can I paint with that yummy Duck Egg blue?!! Hugs to you, Deb. xoxo. Deb! You and hubby did such a great job on your bathroom renovation project! It is totally charming and functional too! Way to go girl! We had fun bringing her back to life! How clever…it turned out terrific! And you’ve given me the how-to’s to tackle one myself. Thanks for the inspiration!